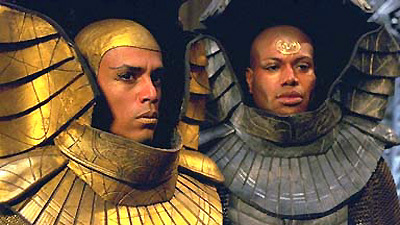 When the Goa'uld Apophis emerges from the Abydos Stargate and kidnaps Daniel's wife Sha're and her brother Skaara, Daniel returns to Earth to join SG-1 and assist in their rescue. Their mission takes them to Chulak where Sha're and Skaara have been selected as Goa'uld hosts. SG-1 is captured, but they are aided in their escape by Teal'c, the Jaffa warrior and First Prime of Apophis who turns his allegiance to Colonel O'Neill. In the ensuing battle, SG-1 is unable to free Sha're or Skaara in time, and they return to Earth determined to find Apophis once again. It has been over a year since the first Abydos mission. Stargate Command is located at the Cheyenne Mountain Complex. Nine SG teams are known only to the President & Joint Chiefs. The Stargate is made of a quartz material. The iris is pure titanium. General Hammond replaced General West. O'Neill is from Chicago. He is separated from his wife since the death of their son. His last 10 years of duty were classified, he retired, has now returned to active duty. Carter is a theoretical astro-physicist, transferring from the Pentagon, studied gate technology 2 years before the Abydos mission. She clocked over 100 hours in enemy airspace during the Gulf War, has flown an F-16. Major Samuels is the General's Executive Officer. Ra is the Sun God from the Book of the Dead, who rules the day. Apophis is the Serpent God, rival of Ra, who rules the night. Chaapa'ai is the Abydonian name for the Stargate. All Jaffa carry a larval Goa'uld. Teal'c has carried one since childhood. In exchange for carrying an infant Goa'uld until maturity, a Jaffa receives perfect health and long life, and will die without it. The people of Abydos are human, brought from Earth by Ra thousands of years ago. Known population approximately 5000. Daniel promises to return to Abydos in exactly one year. Points of origin for Earth and Abydos are unique. It took us 15 years and 3 super-computers to MacGyver a system for the gate on Earth!